The cottage is fully surrounded by a garden, away from roads and traffic noise, and has a vegetable garden next to it where you can enjoy the production if you like, bordered by a canal inhabited by frogs jumping among the reeds into the Magra river flowing 300 meters away. The sea of ​​Bocca di Magra is located about 2 km away, with the beach and the boats that take you to the cliffs of Punta Bianca, in Lerici. Tellaro to Portovenere. At the entrance of the garden there is a car parking space: the owner of the house is 30 meters away in the garden, so there is always a point of reference. The cottage was the artist's studio of the owner that is affected by a particular atmosphere: it contains some works of art and books: it has a corner put up as a kitchenette and a shower. And it's ideal for singles or couples, even with a child. It contains a double bed and a single bed which can be reduced to a sofa and cabinet. In the garden there are 2 tables with seats belonging to the cottage, and also a shower in the trees. There is also a gazebo with mosquito netting around to relax on hot summer days, and also a shower in the trees. Inside the house there are fans that will allow you to always keep some air flowing. The area is among the most beautiful: to the east there are the Apuan Alps, Carrara, Forte dei Marmi, to the west the 5 Terre and Portovenere. Summer 2015; new bed!! Ideal for singles or a couple: it is a unique local for which a child can easily be added; two children involves a lack of space and the addition of a cot and this can create a bit of discomfort. It is advisable to bring your own towels, even for the sea, and sun creams in the warm months is intense. You can make beautiful walks on the mountains and the Apuan Alps: then you can also bring the mountain equipment. 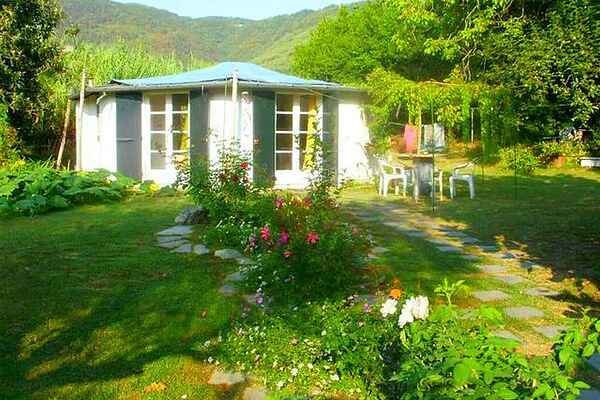 The situation of the cottage is rustic and a bit austere, but for those who wish there are festivals and social occasions anywhere in the surrounding villages. Tips from an enthusiastic visitor Arte e Orto (Art and Vegetable garden) Parking. In all parking meters you can only use coins. The only change machine that we have encountered, is in the laundry on the main road (next to the bakery) and across the street from the bar. In Lerici you can buy a parking in the parking lot for 10 euros for the whole day, free parking in the car park 1.50 per hour. There is a free shuttle to the beach alone and timetables route's not clear (to us?). The parking can be purchased at the ticket machine (coins) or at an employee leave to Porto Venere and the Cinque Terre, see timetables. In high season the parking area already early (10am) was completely full. We went by train to Cinque Terre on the advice of the owners. Departed from Sarzana, there too yoit completely full. There is a car park at the bus station where You may also find a spot. For 8 euros (return pp) we bought a ticket to Monterosso (The last town) and from there you can get back on the same ticket. Another large indoor shopping center with free parking facilities and aircom is in Sarzana. Follow signs Ipercoop or Centroluna. Our experience is that Italians speak little to no English, French seems to give fewer problems The mosquitoes are clearly present in high season. Day and night we left the screens in the windows even when we were not there. It was no problem, there's nobody here. We think this is a great quiet place with treasures of owners who are willing to assist at all times. They speak both English and French. You get fruit and vegetables from the garden. We have been invited to a dinner and one evening with full moon they took us to Monte Marcello, on the mountain where we enjoyed a sea view. Nearby is a huge monastery (Monastero Santa Croce, www.monasterosantacroce.it) where in the chapel you'll find a beautiful statue of a Black Christ. The view from the monastery is beautiful. You might also be able to swim down. The nearest beaches (rock) at Bocca di Magra (paid parking) and Fiumaretta (free parking), both about 3 km away and reach. best by car From Fiumaretta also leave boats: a tour to Cinque Terre is of great interest, with three stops at places to swim. 30 euro p.p., departure at 10.00, lasts until about 17:00. There is also a ferry service to the beach at Punta Corvo, see folder. The hostess has written several historical books about the environment (and sometimes an Italian translation in English) and exhibits her work sometimes with mirrors and photography. Both can tell a lot about the area.